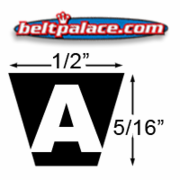 A-Section (Classcial) V-belts are 1/2" (13mm) Wide and 5/16" (8mm) thick. Classic V-Belts. Suitable for all industrial applications, including v-flat drives and lawn & garden power equipment. We offer a limited selection online at this time. Lengths A13 to A180 are stocked at our store location. Please call (317) 519-9020 if you don't see what you need. A28 V-Belt. Consumer Brand A28 V-Belt. 1/2" Wide x 30” Length OC. Replaces Standard 4L300 FHP V-Belts. Classical A29 Industrial V-Belt. 1/2" Wide x 31” Length OC. Replaces Standard Raw Edge 4L310 FHP V-Belts. A40 Industrial V-Belt. Superior replacement V-Belt. 1/2” Wide, 42” Length. Campbell Hausfeld BT-14, Durkee Atwood BT14. A48 V-Belt. Consumer Brand A48 V-Belt. 1/2" Wide x 50” Length OC. Replaces Standard 4L500 FHP V-Belts. A50-KC Ultrapower V Belt. Kevlar Wrap A50 Industrial V-Belt. A50-KC Bando Ultrapower V Belt. Kevlar Wrap A50 Industrial V-Belt. 1/2" Wide, 52” Length OC (1321mm). Superior replacement for Standard Raw edge A50, 4L520K FHP V-Belts. A51 V-Belt. Consumer Brand A51 V-Belt. 1/2" Wide x 53” Length OC. Replaces Standard 4L530 FHP V-Belts. A74-KC Ultrapower V Belt. Kevlar A74 Industrial V-Belt. 1/2" Wide, 76” Length OC (1930mm). Superior replacement for Standard Raw edge A76, 4L760 FHP V-Belts. A101-KC Bando Ultrapower V Belt. Kevlar Wrap A101 Industrial V-Belt. 1/2" Wide, 103” Length OC (2616mm). Superior replacement for Standard Raw edge A101, 4L1030 FHP V-Belts. A102 V-Belt. 104 Inch Length. Power King (HI-POWER II) Industrial V-BELT. A103-KC Ultrapower V Belt. Kevlar Wrap A103 Industrial V-Belt. 1/2" Wide, 105” Length OC (2667mm). Superior replacement for Standard Raw edge A105, 4L1050 FHP V-Belts. A109 V-Belt. Consumer Brand A109 V-Belt. 1/2" Wide x 111” Length OC. Replaces Standard 4L1110 FHP V-Belts. A120-KC Bando Ultrapower V Belt. Kevlar Wrap A120 Industrial V-Belt. 1/2" Wide, 122” Length OC (3099mm). Superior replacement for Standard Raw edge A120, 4L1220 FHP V-Belts. A136 Industrial V-Belt. Classical A-136 Belt. 138" Length (3505mm), 1/2" Wide (13mm). A144 Industrial V-Belt. 1/2" Wide, 146" Outside Length (145.3" Datum length) Industrial V-Belt. Suitable for all industrial applications, including v-flat drives.